Maintain doctor visits. You need to be healthy in order to take good care of another person. Don’t forget to make regular 6 month check ups to practice preventive care. It is extremely easy to push off your own health when you are caring for another. However, it will catch up to you whether it be in the form of extra colds during the year or full blown caregiver burnout. It is necessary to check in on your personal and mental health regularly to avoid the extra stress. Exercise. Most people don’t feel like exercising and it is difficult to find the energy and time to do so when you are caring for another. However, with changes to your regular routine and adding exercise starting at 15 minutes a day to working your way to at least 30 minutes a day, you will feel more energized. Exercising is a stress reliever and mood enhancer. It rebuilds fatigued muscles and improves circulation to maintain healthy blood flow to your heart, brain and muscles. If you can’t do 30 minutes of straight exercise, break it up into three 10-minute sessions. Going for a walk once or twice for 15 minutes each. Getting outside the house is a great way to change your perspective so you can practice personal reflection. This will take care of your spiritual energy as well. Meditate. A daily relaxation or meditation practice can help you relieve stress and boost feelings of joy and well-being. Yoga, deep breathing, progressive muscle relaxation, or mindfulness meditation all can be a benefit to the mind and body. Even a few minutes in the middle of a stressful day can help you feel more balanced. Eat well. Have you heard your body is a temple? I am sure you have. Your body and mind will perform better with fresh fruit, vegetables, lean protein, and healthy fats such as fish, nuts, and olive oil. Sugar and caffeine are addictive and very tempting when you don’t feel like you have enough energy— They will provide a quick pick-me-up but you will have an even quicker crash—so stay away from junk food and fuel up with healthy foods to maintain your energy level. Make sure you sleep! Most people need more sleep than they think they do (8 hours is normal for an adult, more for a child and adolescent). When your body is sleep deprived, you create a sleep debt that needs to be repaid. If you get less sleep, your mood, energy, productivity, and ability to handle stress will take a nosedive. 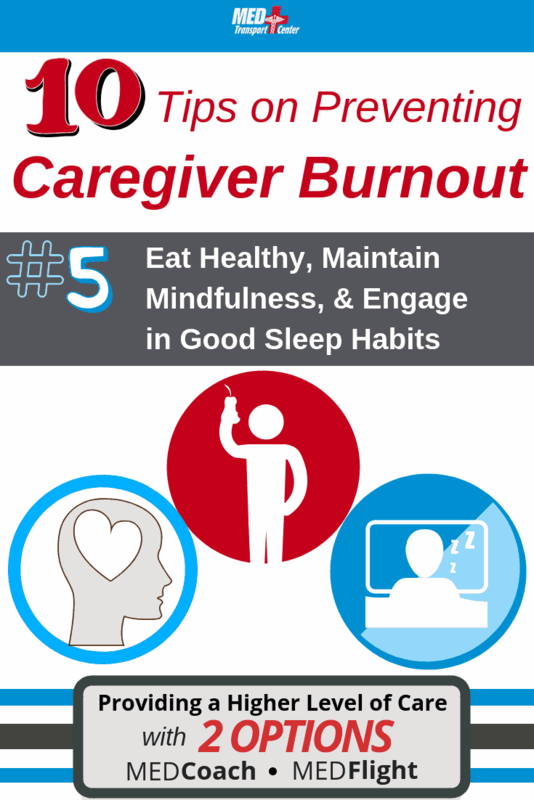 Do you know what it feels like when you are on the brink of Caregiver burnout?